Ok, I guess this isn’t exactly blue… But it’s kind of purple! 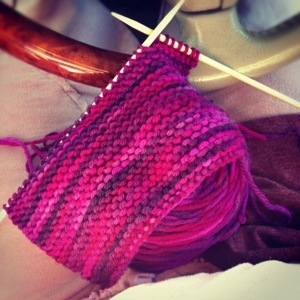 Sitting in the car waiting to pick up the littles and working on a pair of almost mittens for Lu. I’m using a beautiful variegated Cascade 220 on size 6 needles. Cast on 30 stitches. Look for the next post to see how many rows I end up with!